Here is a signed Webb Whale Oil Lamp. It was made by William Homes Webb (1773-1868), in Warren, Maine. 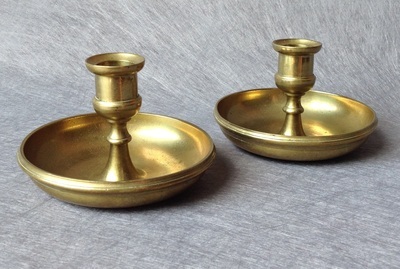 I have seen and owned many of these brass whale oil lamps over the years, but I kept this one because I think it is the nicest form I have ever encountered. 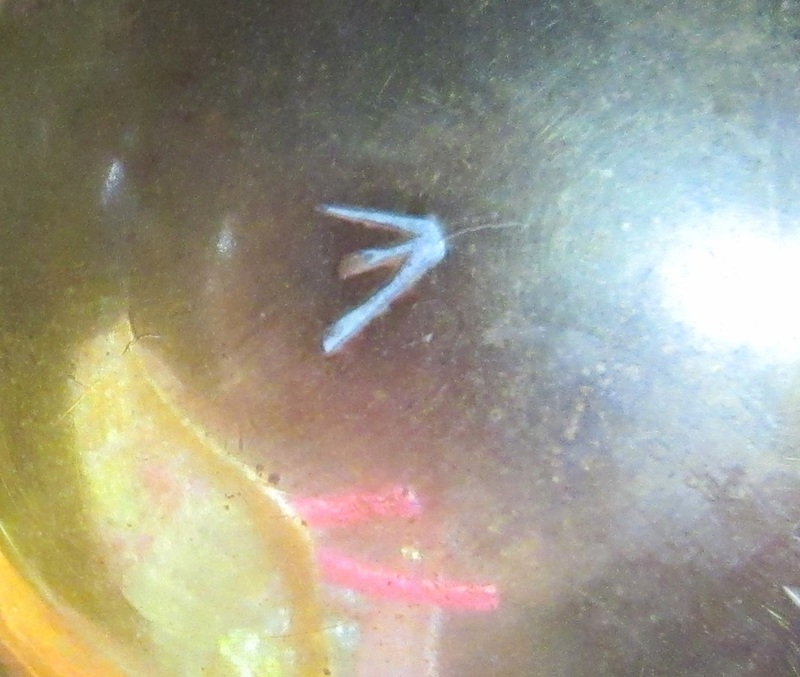 The suppressed belted ball font, and the suppressed belted ball knop are unique in my experience. 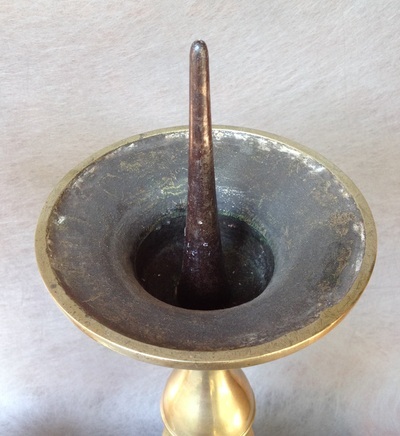 It is in excellent original condition, and is approximately 8" tall, being about 9 1/4" in overall height including the wicks. 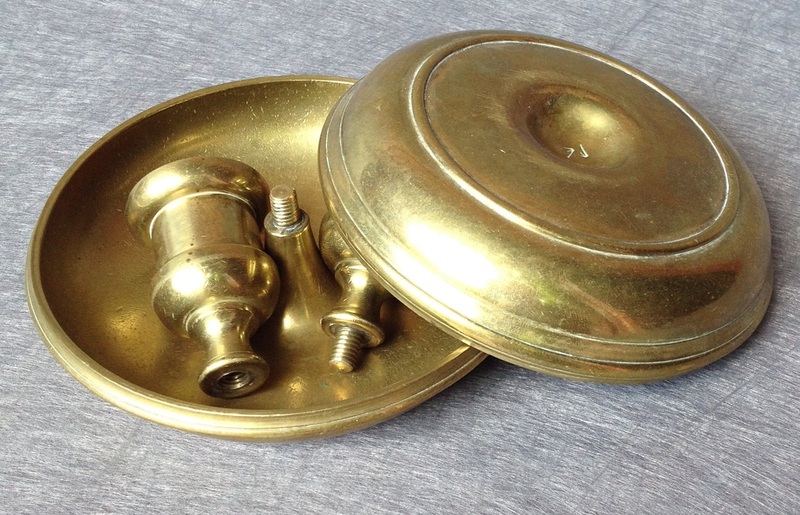 Here is a pair of heavy cast brass candlesticks, in a form that is referred to as "Brighton's Buns". 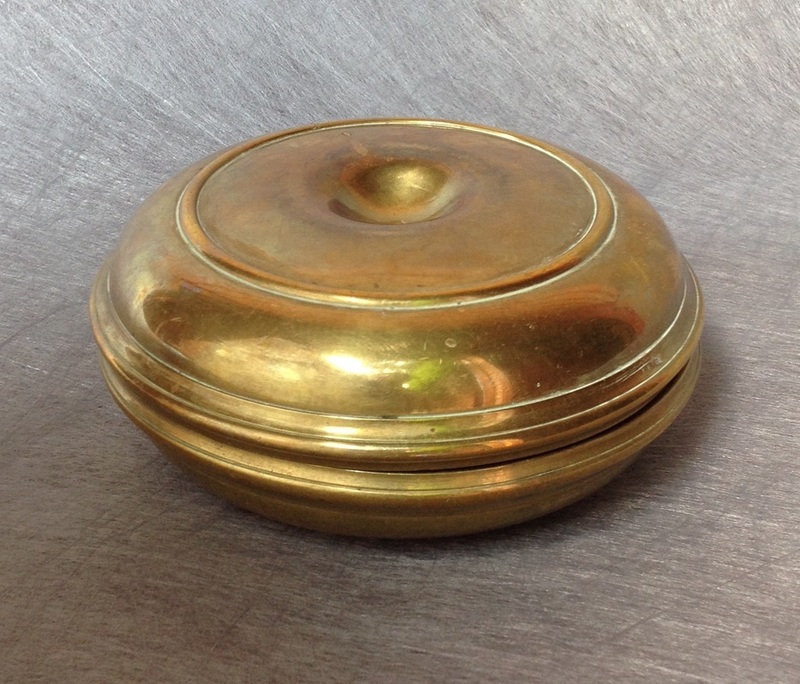 They have historically been associated with officers in the British Army, from the early 18th century, up into the early 19th century. This particular pair is very rare, in that they are marked with the Broad Arrow, which stands for Crown ownership. 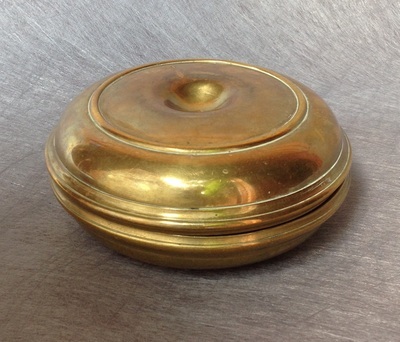 This pair probably date to around 1780, and are 4 3/4" in diameter, and 3" tall when assembled. 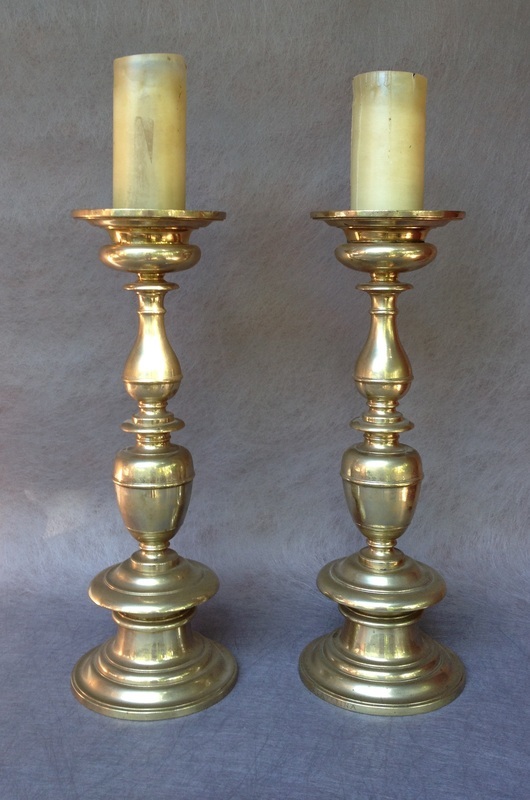 This is a pair of large and impressive pricket candlesticks. 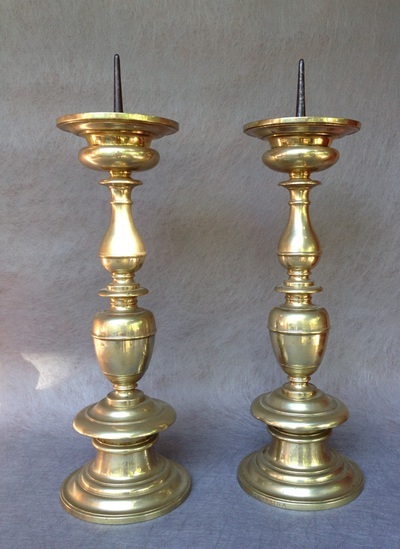 They are German, and date from the late 16th, to the early 17th centuries. 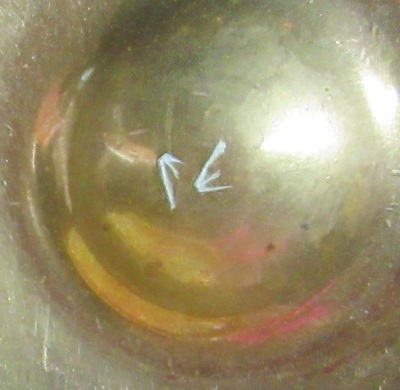 They are 20 1/2" to the top of the drip pan, and the drip pans are 6 1/2" wide. 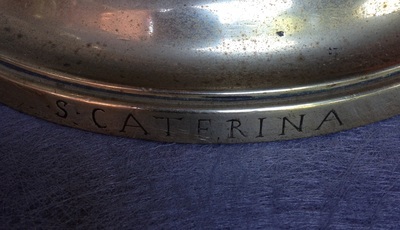 They are both marked "S Caterina". 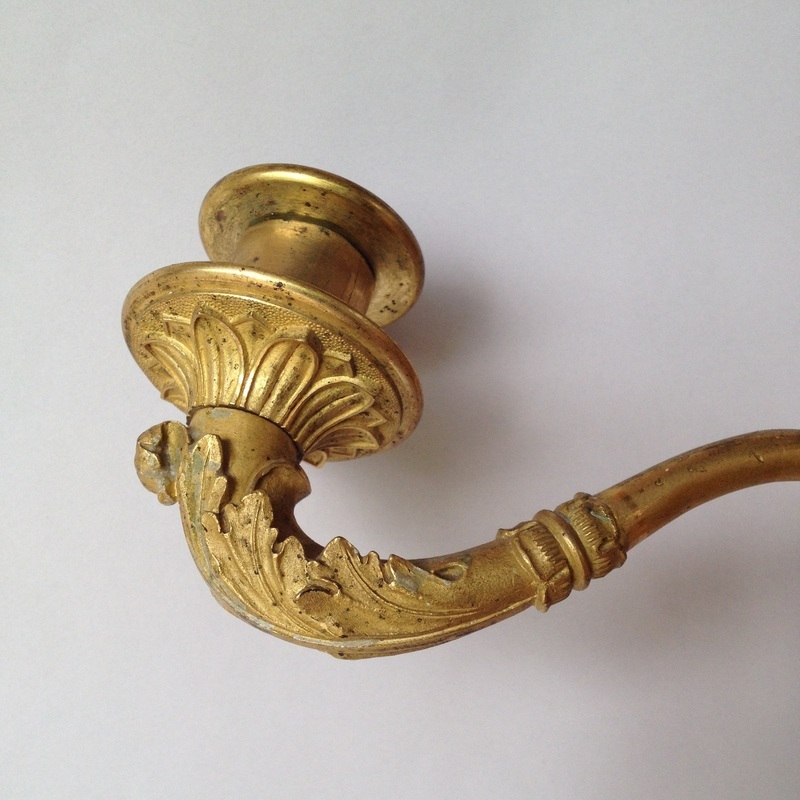 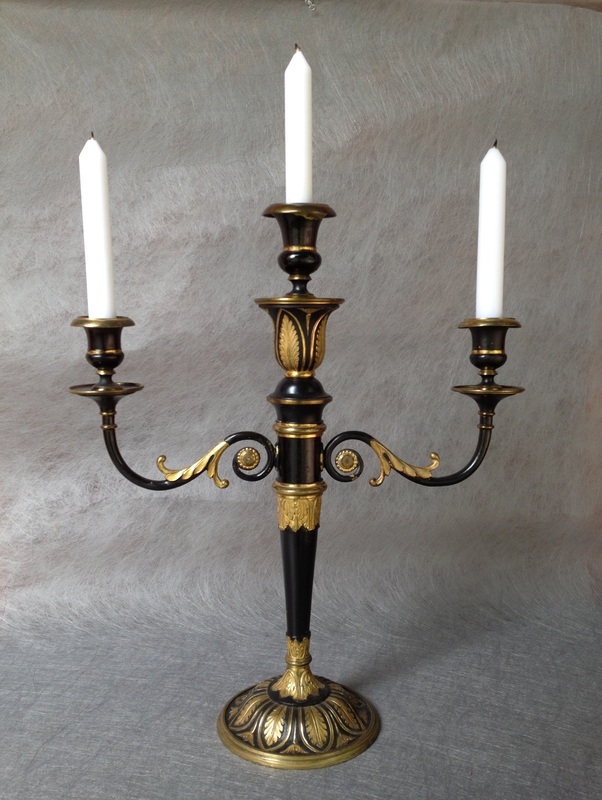 Here is a beautiful ormolu 3 socket candelabra. 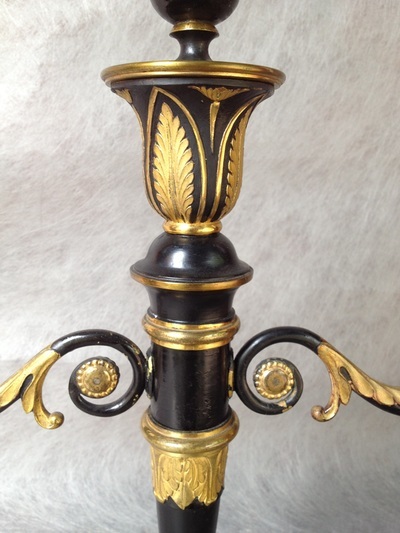 It is partially gilded, and partially japanned, which creates a stunning contrast. I believe it dates from the first third of the 19th century, and is French. 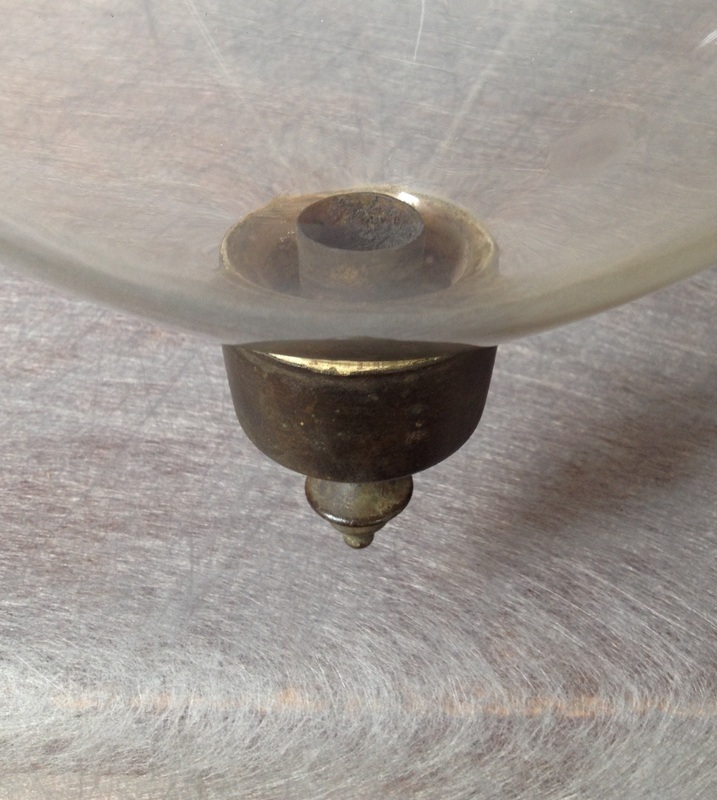 It is quite heavy and sound, with no repairs that I can detect. 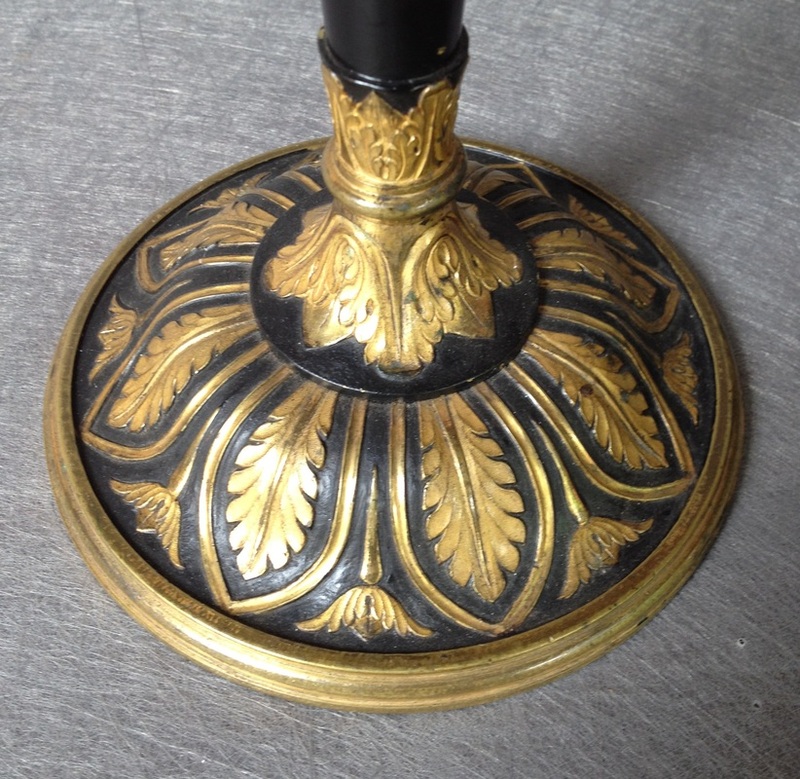 A wonderful centerpiece for a dining or side table, it stands 17 58" tall, and 15" outside to outside of the drip pans. 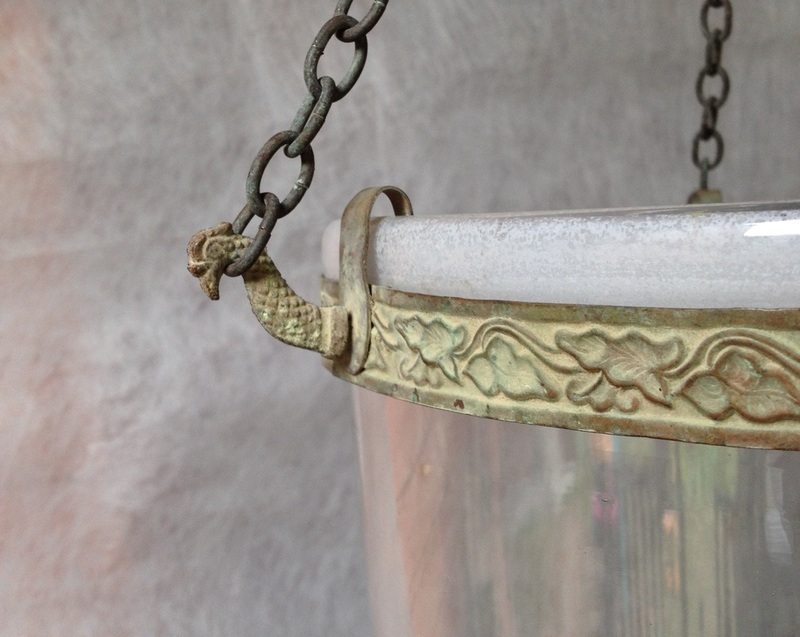 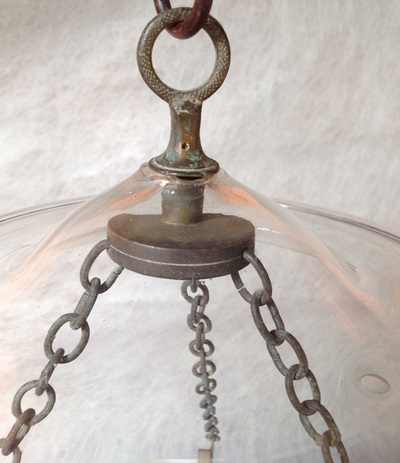 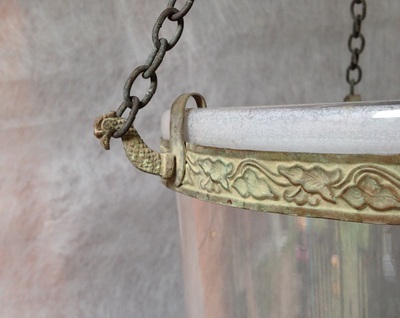 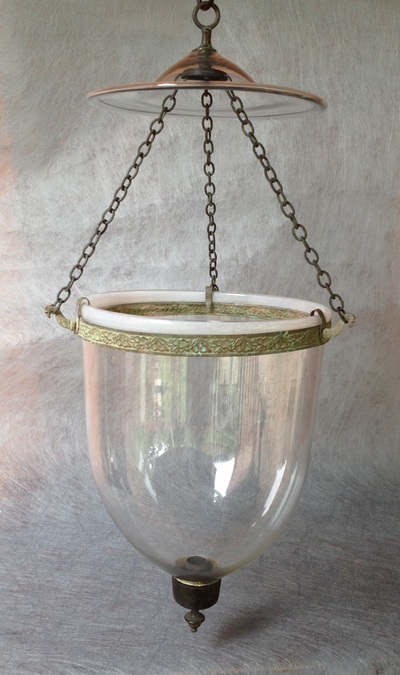 Here is a very nice 19th century brass and glass hall lantern, that has escaped being electrified. 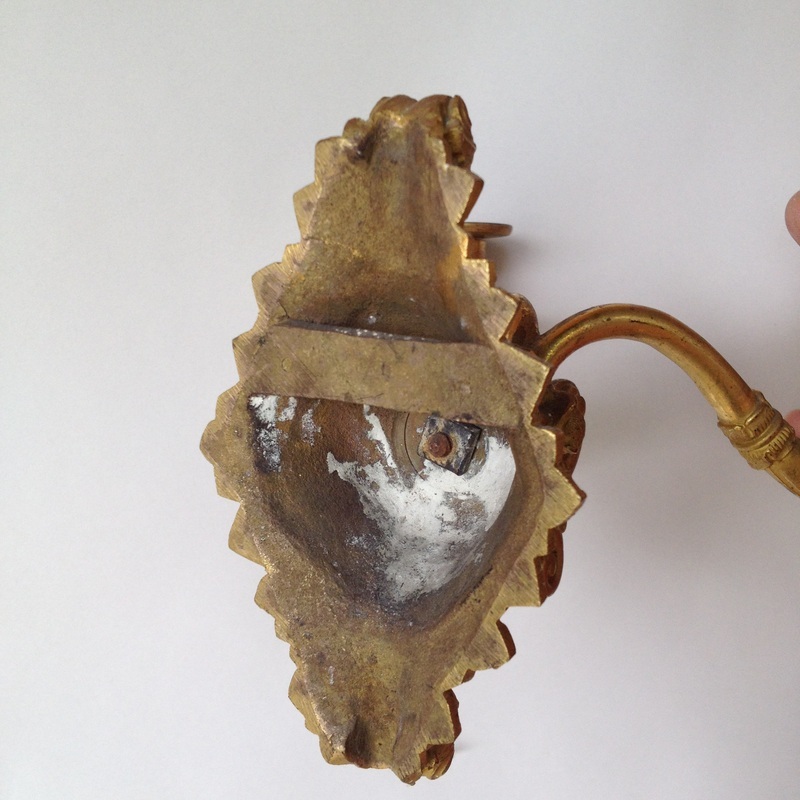 It is all original, with it's screw in candle socket. It is approximately 10" in diameter, and about 27" in overall height. 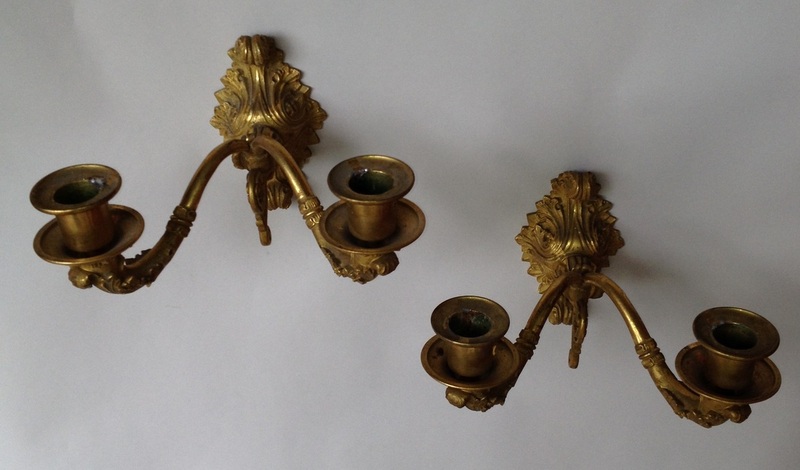 Here is a pair of fine quality double armed Ormolu Sconces, that probably are French, and date from the 1810-1830 period. 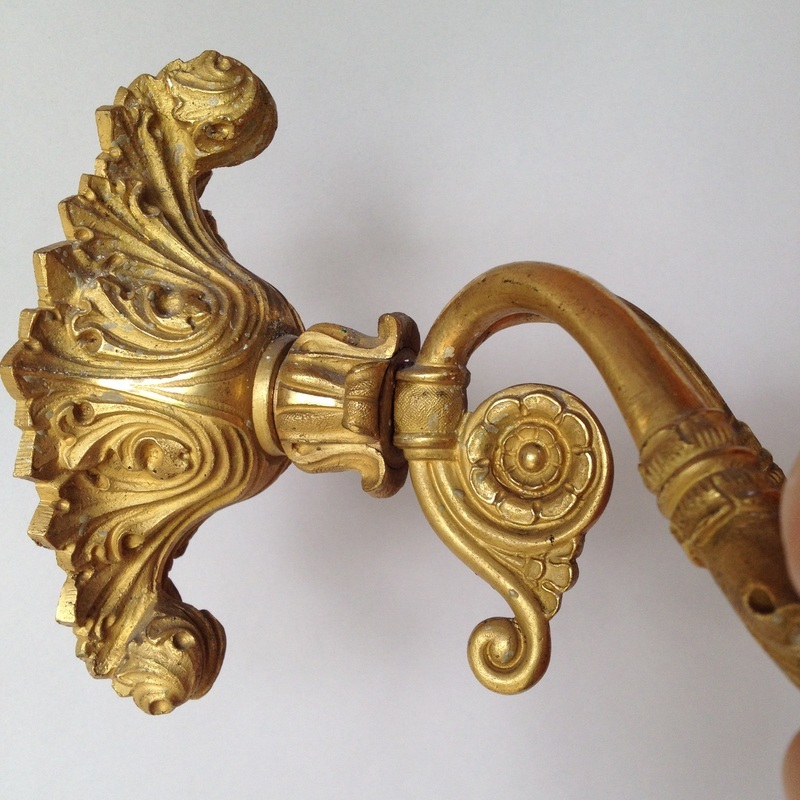 They seem to retain most of their original gilding, and are in wonderful condition for their age. They stand about 7 1/2" from the wall, and about 8 1/4" in their extreme spread.